Deleting and recreating dial-up network connections doesn't apply if using VZAccess® Manager 7 or higher. VZAM® v7 or higher creates a temporary account to connect and automatically deletes the temporary account when disconnected. From the Dock/Desktop, locate and click the VZAccess Manager icon. Alternatively, you may click Finder from the Dock. From the sidebar, click Applications then double-click VZAccess Manager. From the menu bar, click Options > Run Setup Assistant. From the Getting Started screen, click Continue. Select the account(s) to delete then click Delete. If prompted to Authenticate, enter the Name/Password then click OK. If required, in the Authenticate screen enter the administrator's Password to make changes. If administrator credentials are not known, contact the system administrator for assistance. Select the appropriate option then click Continue. If you are configuring a AirPort (Wi-Fi) device, skip to step 13. Insert your PC Card into the Macintosh PC Card slot then click Continue. Select the wireless account to install then click Continue. On the Wireless Account Setup Complete screen, click Continue. 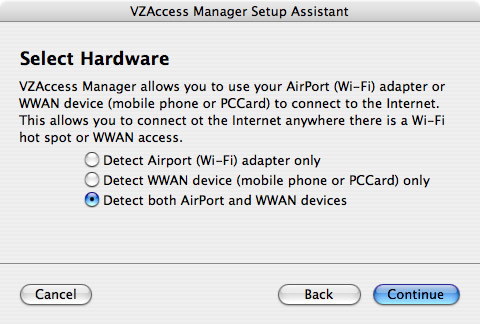 Click Continue to enable AirPort (Wi-Fi) support.